NCSA’s are a well-attended meet this year. Tonight’s session opens with a whopping 12 heats of the boys 1000 free. The girls 100 IM has drawn 22 heats and the boys have 19. Even the 800 free relays have 9 boys heats and 7 girls. The early top seeds remain with only a handful of scratches in the top 24 seeds. 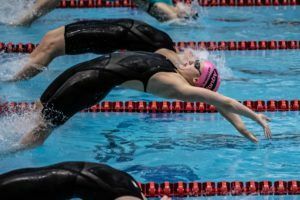 The girls 100 IM lines up some of the nation’s top 16-year-old multi-stroke stars: Grace Sheble is the top seed for Nova of Virginia, with Nation’s Capital’s Phoebe Bacon and Arlington Aquatic Club’s Torri Huske also in the mix. 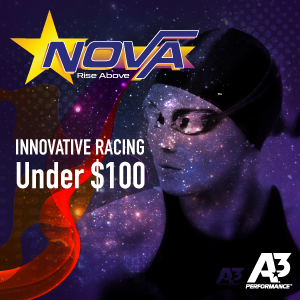 Rockville Montgomery 18-year-old Ryan Vipavetz is the top boys 1000 free seed, while 15-year-old Paige McKenna of Nation’s Capital leads the girls event, looking to improve her 21st rank in U.S. 15-16 age group history in that event. 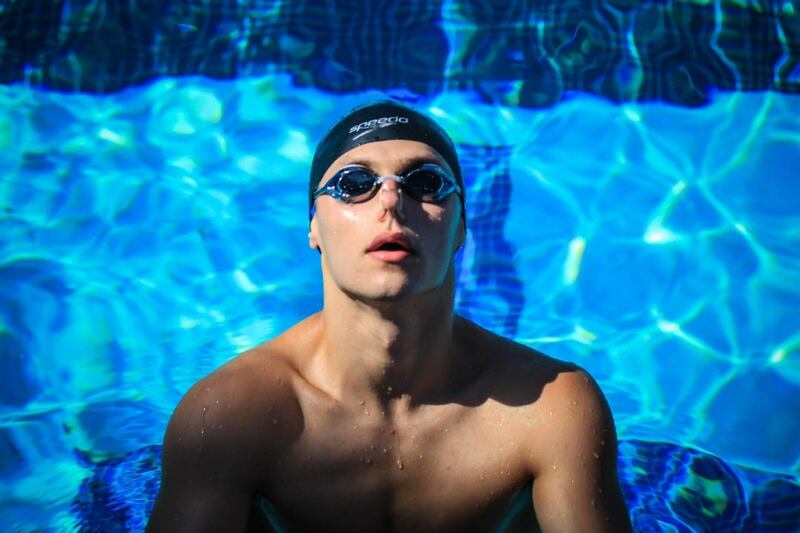 The boys 100 IM is a more veteran field, with 18-year-old Stanford commit Shane Blinkman of St. Croix Swim Club holding the top seed ahead of Nation’s Capital and UVA commit Sean Conway and Long Island/Cal commit Jason Louser. Nation’s Capital is the top seed in both the boys and girls 800 free relays. Keep refreshing this page for live, event-by-event updates of all the action from Orlando. The timelines for tonight show a pretty long timed finals session: the meet is running two-pool racing tonight, but heats of the 1000 free still aren’t projected to finish until about 5:15 Eastern or later – well over an hour after the session start. That means you probably won’t see official results or event recaps go up here for awhile, but stay tuned as well update events when we can. 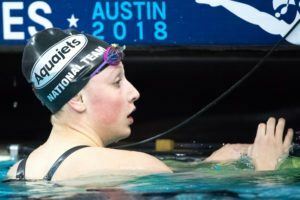 15-year-old Paige McKenna moved up to 17th all-time in USA Swimming’s 15-16 ranks of the 1000 free, turning in a 9:35.99 to win the opening event of NCSA Juniors. Nation’s Capital’s McKenna was already ranked 21st in age group history with more than a year left in the age group. She passes Olympian Elizabeth Beisel on the list and is within 11 seconds of everybody on the list not named Katie Ledecky. Fellow 15-year-old Rachel Stege of Fox Valley dropped eight seconds off her best to surge to 46th on that list. Stege went 9:43.09 to take second. Third went to 18-year-old Brooke Travis out of NCAP. Travis is a high school senior committed to Virginia Tech for next year. She went 9:49.65, eking out bronze over Lexington Dolphin Rachel Klinker (9:49.67). Also of note back in 12th was 13-year-old Mary McKenna out of Long Island Express, who went 9:58.42 and is on the cusp of breaking into the top 100 in USA Swimming 13-14 age group history. It was a good 1000 free event for Virginia Tech commits. After Travis’s big swim on the girls side, incoming VT freshman Ryan Vipavetz held the top spot in the boys event. He didn’t quite better his lifetime-best of 9:05, but won in 9:07.56, beating the field by three seconds for Rockville Montgomery Swim Club. Unattached Garrett McGovern of Virginia went 9:10.75 for second, besting NOVA’s Christopher Dallavalle. 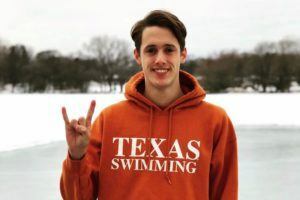 The 16-year-old McGovern dropped more than ten seconds from seed, and his time would rank just outside the the top 100 in USA Swimming 15-16 age group history. 18-year-old Dallavalle dropped two and a half seconds from seed to earn bronze. It was a tight finish for third. Machine’s Daniel Gyenis was 9:11.51, Jacob Rosner 9:11.72 and Dylan Porges 9:11.89. Arlington’s Torri Huske won a very close race in the 100 IM, besting two more junior stars by a few tenths. 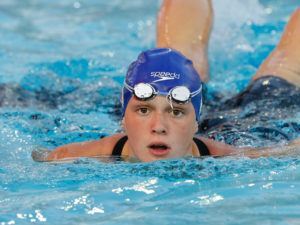 She was 54.20, beating Nation’s Capital’s Phoebe Bacon (54.34) by a tenth and Aquajet Isabelle Stadden (54.43) by two. It was a battle of different strokes. 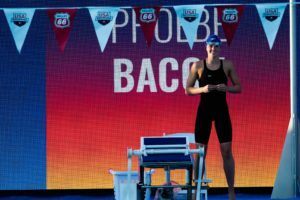 Huske is best known for her national high school record 100 fly, while Bacon and Stadden are both accomplished backstrokers at the senior national level. Those three finished a good half-second ahead of the rest of the field. #20 Will Myhre was second in 49.31, followed by honorable mention Kimani Gregory (49.71) and #8 Sean Conway. 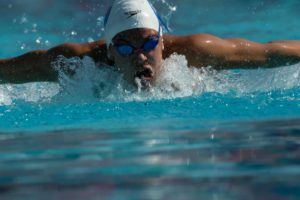 Myhre swims for St. Charles Swim Team, Gregory for Race X Aquatics and Conway for Nation’s Capital. 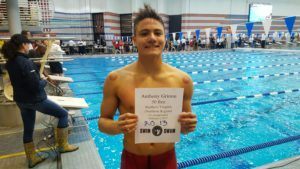 Of note: 16-year-old Anthony Grimm, who made waves with his stellar 50 back split at Virginia’s high school state meet, had the fastest time of the whole event at 47.80, but was disqualified out of his heat. Nation’s Capital held their top seed and won the girls 800 free relay. 1000 free winner Paige McKenna came off of that win to split 1:47.28 to lead the team. She was joined by Katelyn Mack (1:47.10 leadoff), Carly Sebring (1:49.31) and Claire Nguyen (1:49.32). NOVA of Virginia was second, about a second and a half back. Grace Sheble had a stellar 1:46.88 leadoff leg, beating her own best time by two tenths. She now ranks 98th in the all-time 15-16 ranks. Long Island took third, getting a strong 1:46.03 anchor leg out of Chloe Stepanek, who already ranks 92nd on that 15-16 age group list. 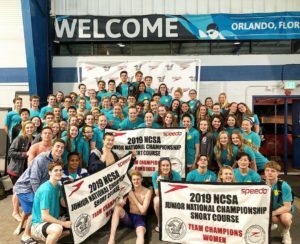 Long Island Aquatic Club caught top-seeded Nation’s Capital, and the two relays tied for the NCSA junior title. Long Island stormed home on a 1:37.27 anchor leg from Jason Louser, who will join the University of California next year. Timothy Marski was 1:38.40 on the leadoff, with Ryan Davidoff (1:41.77) and William Swartout (1:39.07) swimming the middle two legs. NCAP took the lead on a stellar 1:36.19 split from Conway in the second slot. Anthony Nguyen led off in 1:40.94, Mitchell Meyer was 1:40.67 and Peter Makin anchored in 1:38.71, though it wasn’t enough to hold off Louser. Fox Valley took third on a 1:37.83 split from Aayush Deshpande. Grimm just went 47.80 100 IM, out in 20.99. Won the event in an early heat. Backstroke breakout and it looked like he moved early on the start. Shame. He clearly was the fastest by far. Lol is it? If it’s underrated at all, it’s only because they give out 45 state championships…but even then, i’m not sure I’d call it ‘underrated.’ I think everyone is well aware of the quality out of the state of Virginia. 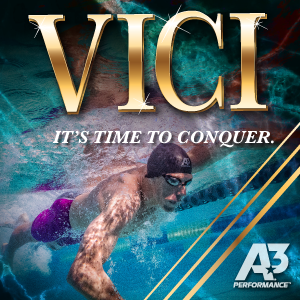 I’d give $500 to see Dressel swim a tapered 100IM SCY, vs Andrews. 44? Dressel doesn’t have a 100y back time listed at all… but if you give him 47.0 (which seems… extremely conservative), averaging his 4 100s gives a 44.9. Throw Vlad in there. Fastest SCM 100 IMer in history. 2013 Florent Manaudou would have been silly fast, too. I think he’d have given Vlad a run for his money.